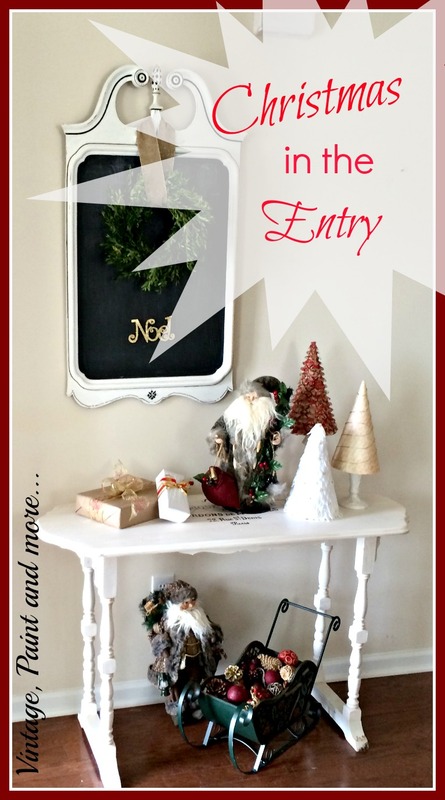 I have teamed up with a few of my fellow bloggers to bring you the Blogger Christmas Series. 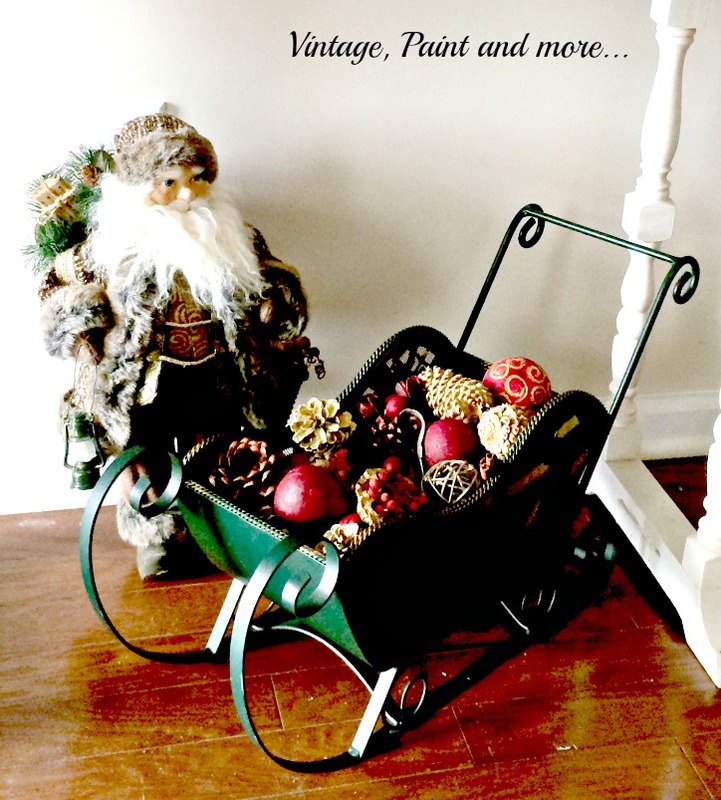 This is a collection of Home Decor, Crafts, Holiday Tablescapes, Recipes and so much more to inspire you during this holiday season. Today I am bringing you my Christmas entry. 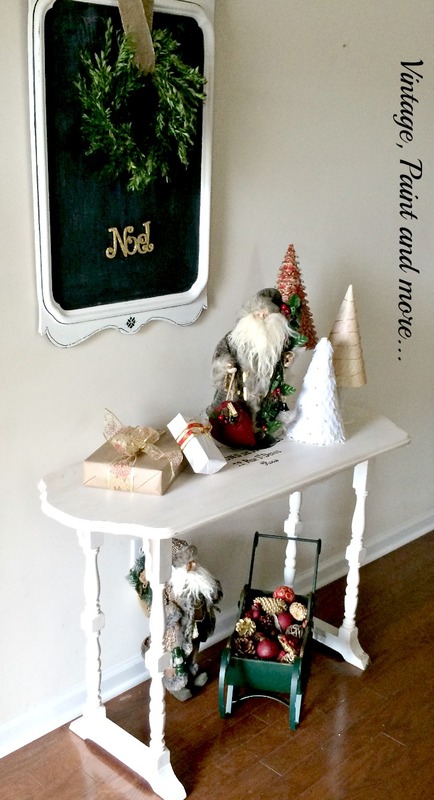 Last year I decided to use all neutrals in our decor as you can see at Christmas 2013 - A Review. I loved the way it turned out but my family (and I have to admit even I ) started missing the beautiful colors of red and green that come with Christmas. So this year I decided to bring back the color and intersperse it among the neutrals. 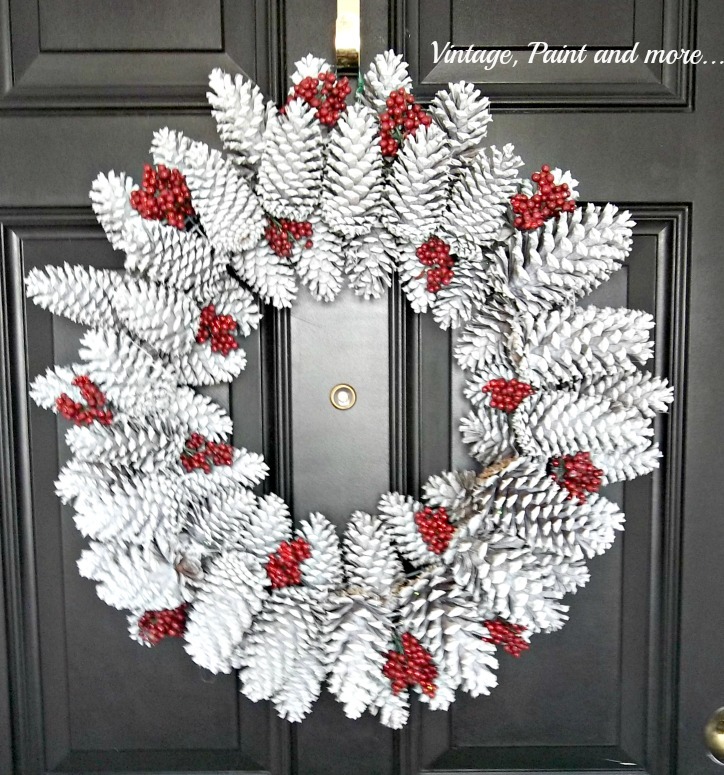 First of all our Pine Cone Wreath greets you at the front door. I made this a couple of years ago after much procrastination. I love the way the white of the pine cones pop against the black of the door and the red berries against the white of the pine cones. Pine cones and berries just speak holidays to me and putting them together was so natural. Our entry is actually a large hallway that leads to the living and dining rooms. As most of you know we just moved into our home recently and have not found what we want in this area so I decided to use my French Sewing Table I painted last spring. In keeping with my decision to use more color this year I also decided to use my collection of Old World Santas. On top of the table I placed one of my favorite Santas along with three cone trees I made - one from ribbon, one from scrapbook paper and gold cord, and one from felt triangles and gold beads. These little trees are so simple and quick to make and add a lot of interest to your decor depending on what materials you use to make them with. 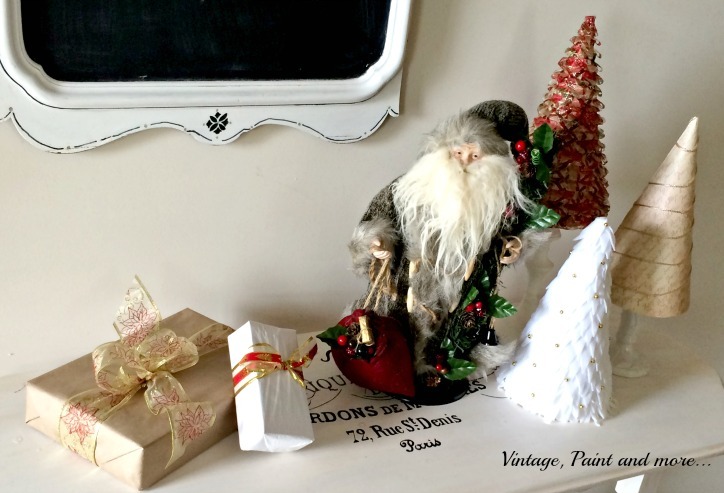 I then placed a couple of "faux" Christmas packages on the table. These are just a cereal box and another box that are wrapped with brown parcel paper and tissue paper then wrapped with pretty wired ribbons. Easy decor at very little to no cost. Above the table I placed my Black and White Chalkboard I made from a vintage mirror. I also made a boxwood wreath to hang on it with a piece of burlap ribbon. I have always wanted a boxwood wreath and when I saw a bunch of boxwood at Home Depot for $6 I decided I would make my own this year. It was quite simple. I just cut little twigs of the boxwood and stuck it into a 10" grapevine wreath. No glue - no mess. I had this little N-O-E-L sign that is actually a Christmas ornament I bought at the dollar store. I just used a couple of glue dots to stick it to the chalkboard. Under the table I placed another one of my Santas and a green metal sleigh I have had for years. I simply filled it with pine cones, decorated balls and potpourri for color, texture and aroma. I love filling things with this combo and sitting it around the house during the holidays. It lends a feel of Christmas without a lot of cost or fussiness. And the aromas waft through the house nicely. Now that I have the entry done I think I may just be ready to move on through the rest of the house. Don't forget to check out all the rest of the bloggers that are contributing to this series. You will find so much great creativeness and inspiration. Until next time - enjoy creating something you love. 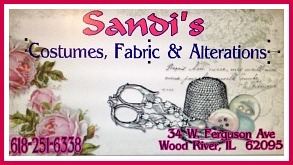 I will be joining the parties listed on the Where I Party page. 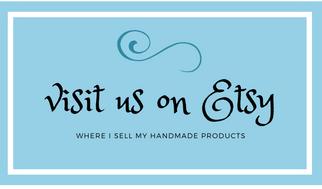 Please visit them and check out all the great inspiration and creativeness found there. I absolutely love that chalkboard! 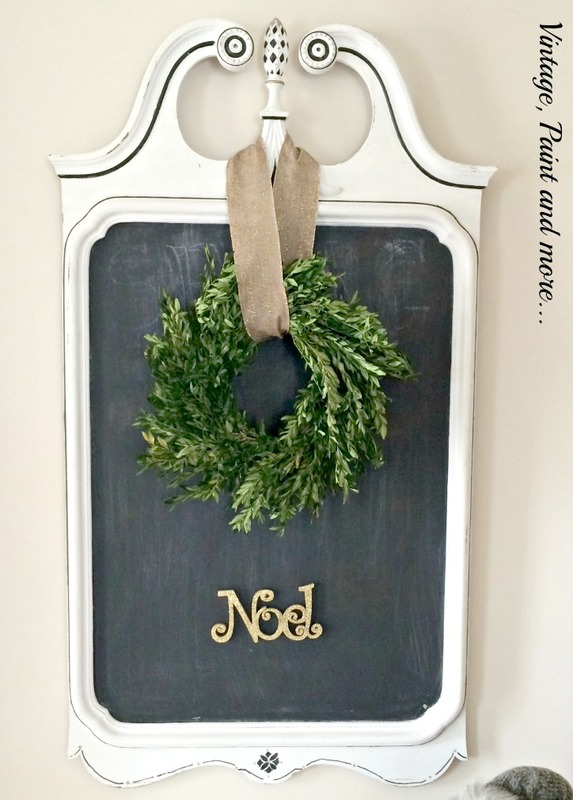 (I'm a DIY chalkboard fanatic.) It has great lines that make it prettier than your average bear. $6.00 for boxwood? I've got to check out my local Home Depot! I have a few boxwood wreaths I bought at a pretty decent price on sale, but they're never cheap. Now I have the confidence that I can make one myself! Your entryway is absolutely stunning! You just moved into your house this year? Wow! Your talent has already turned that new house into your home. I love the way you took new and old and merged them into just the right balance. I am glad I found your blog throug the Blogger Christmas Series. Absolutely gorgeous and your pictures are fantastic! You are very creative! Very nice, Cathy! Love the arrangement at the entry, but I really love the wreath. You always have the prettiest things. 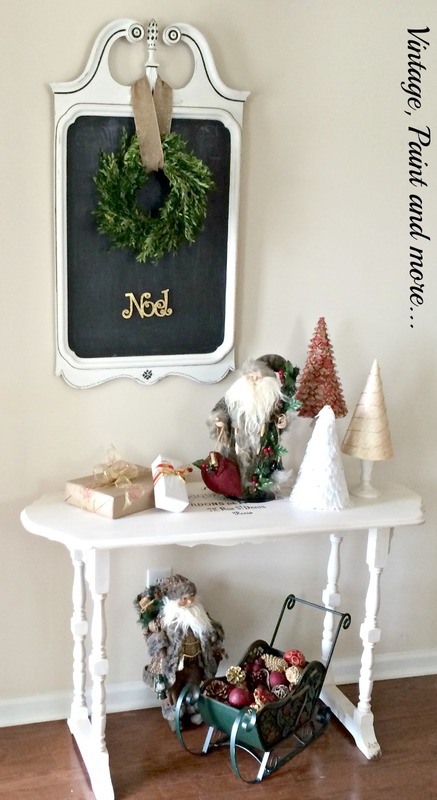 I love that white frame & wreath. WOW this is absolutely BEAUTIFUL!